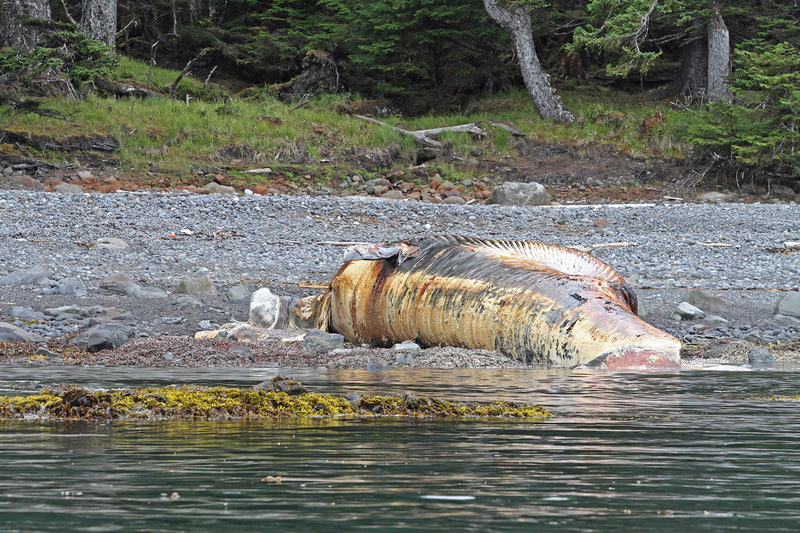 One of the biggest thrills we get while out fishing is seeing the wildlife that lives there. 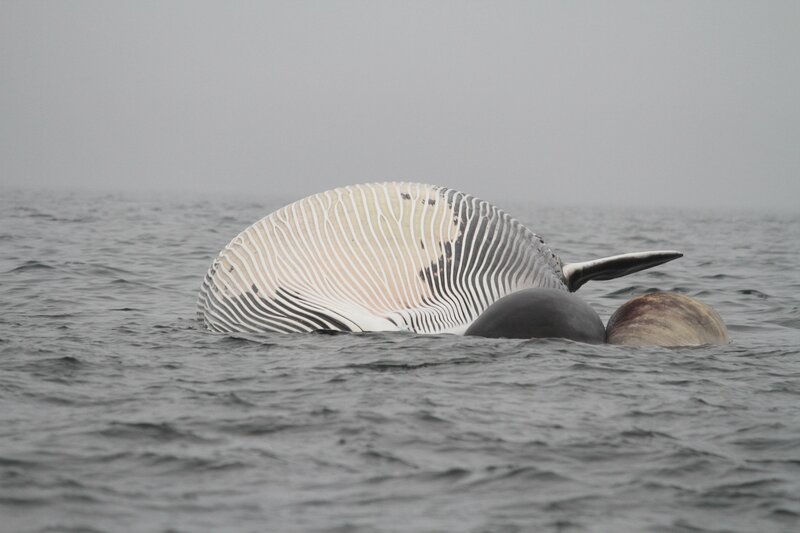 On any given day we’ll often see black bears and Sitka black-tailed deer, eagles and numerous seabirds, giant Steller sea lions, orcas and humpback whales. 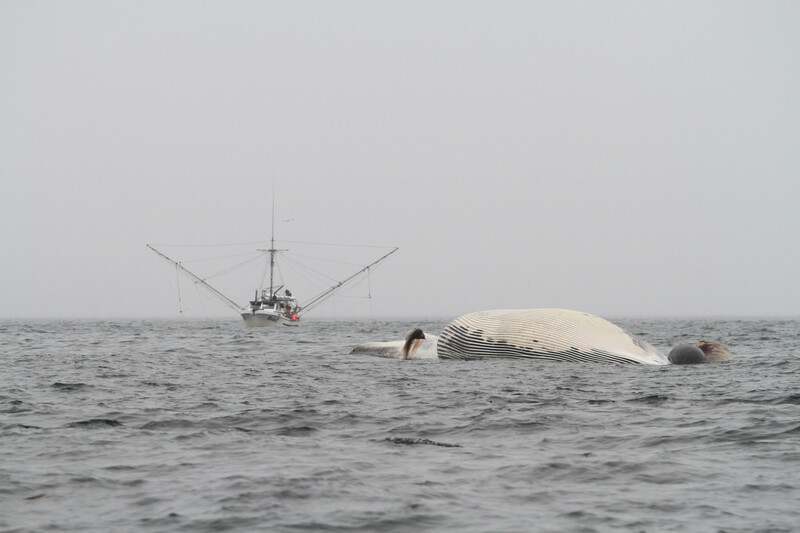 But QCL guests got quite a shock the evening of July 19th when a huge dead whale was spotted floating in the vicinity of Shag Rock in the heart of our fishing grounds. 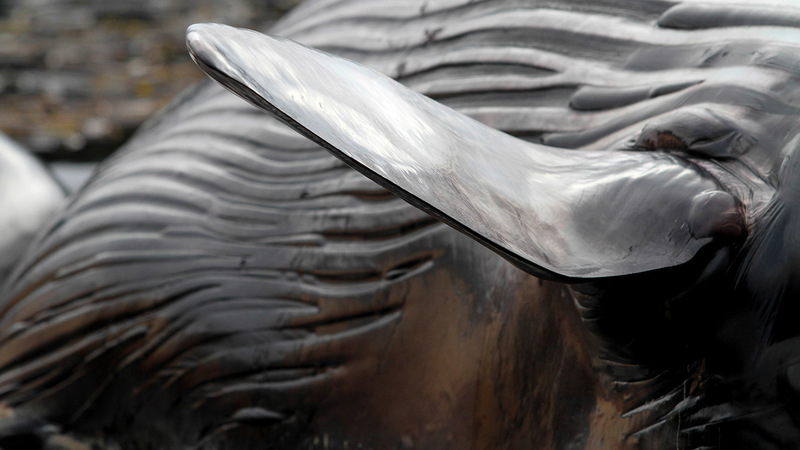 View our collection of photos here. It was a beautiful blue-sky day and a couple of our guides noticed a large white shape, almost sail-like, off towards the northern horizon. 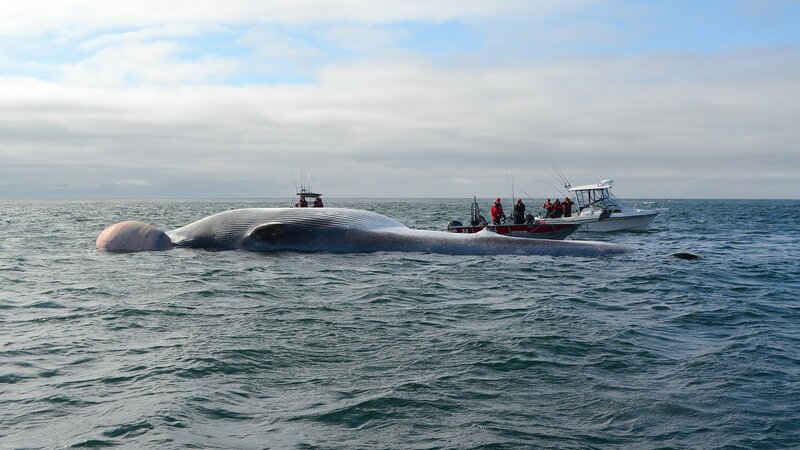 When they motored out to inspect it they discovered the bloated white belly of an enormous whale floating 7 feet above the water. 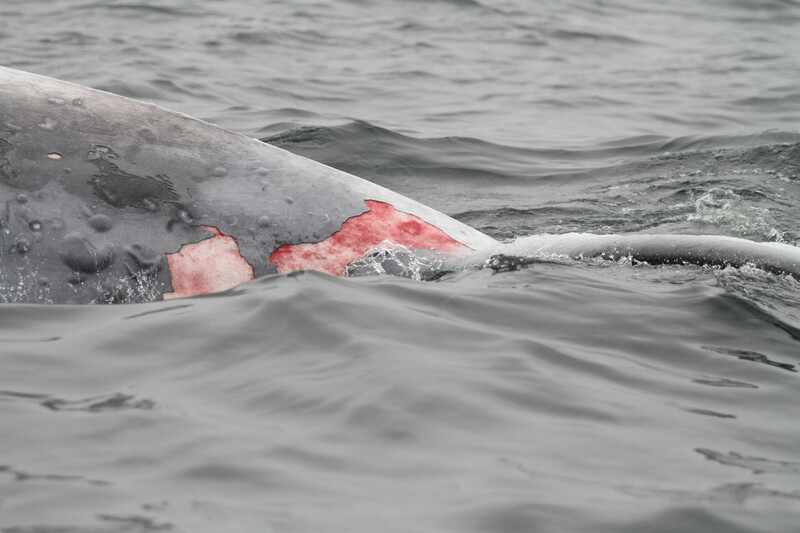 The gases built up inside had forced the stomach sac out its mouth to float alongside. With no signs of injury visible the obvious question was the cause of death. Fishmaster Matt Burr took photographs, which we sent off to Caitlin Birdsall with the Vancouver Aquarium whale sightings team. 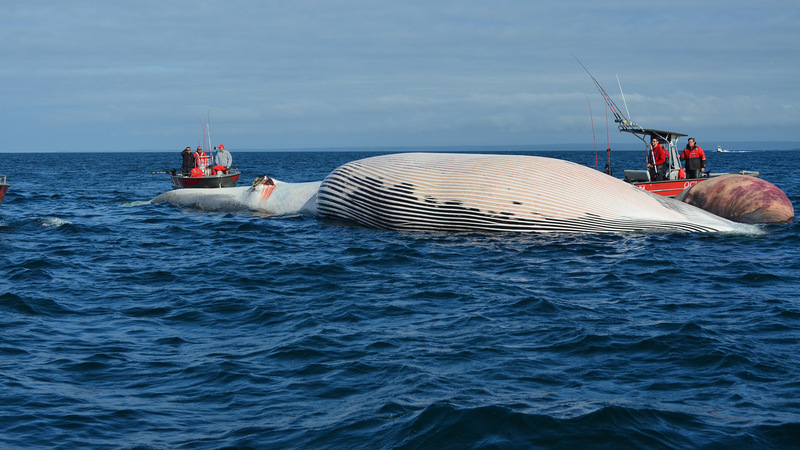 They dispatched a biologist from Fisheries and Oceans who came out to examine the whale. 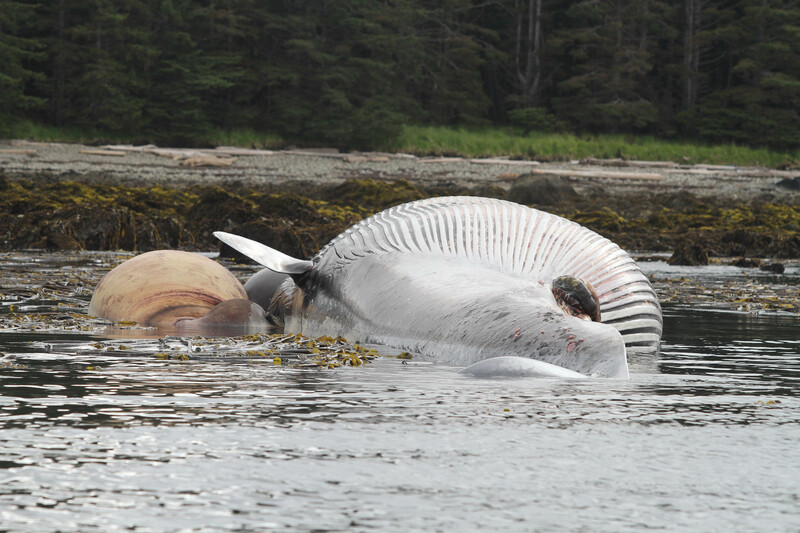 He was able to confirm that it was indeed a mature female fin whale. 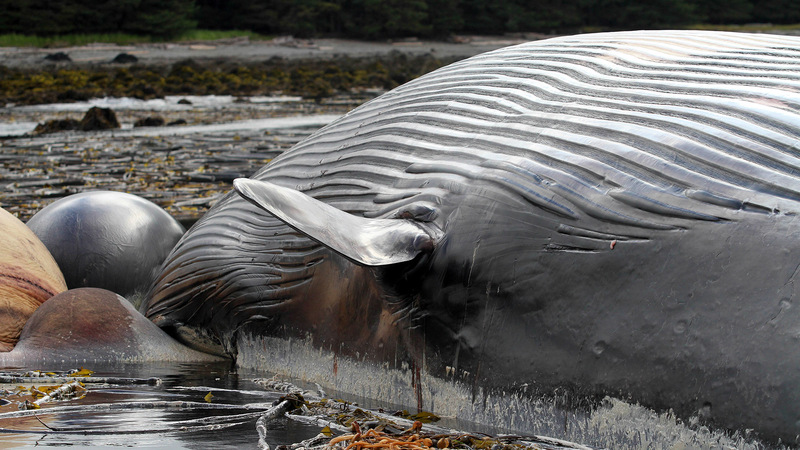 It measured just one inch short of 70 ft. long. 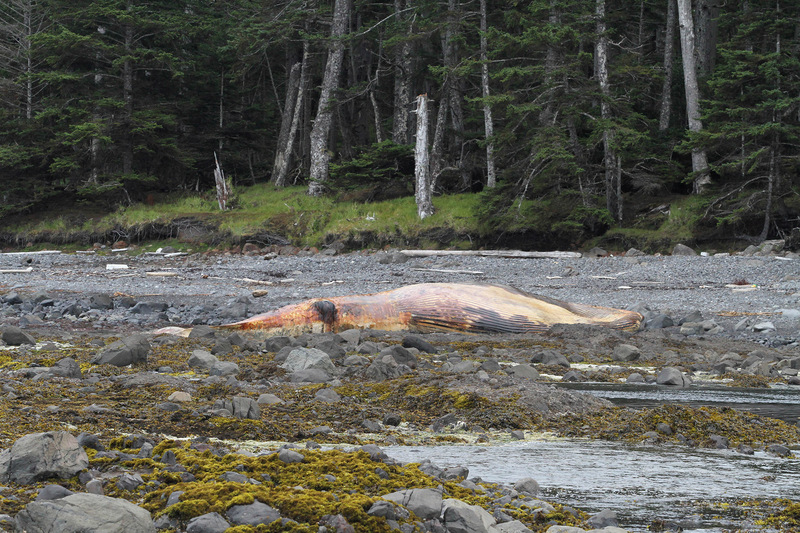 By the time they got access to it decomposition had progressed to make it difficult to determine the cause of death. 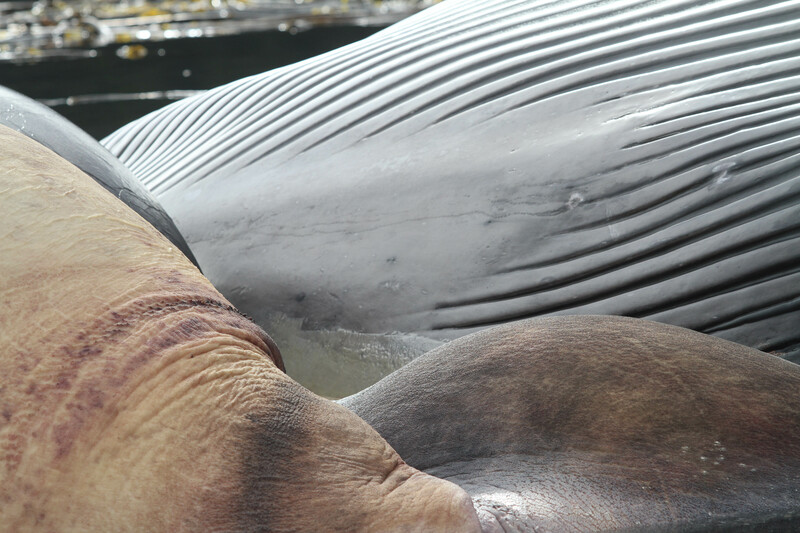 They were able to collect samples for the veterinary pathologist that investigates these incidents as well as take some other morphological measurements. 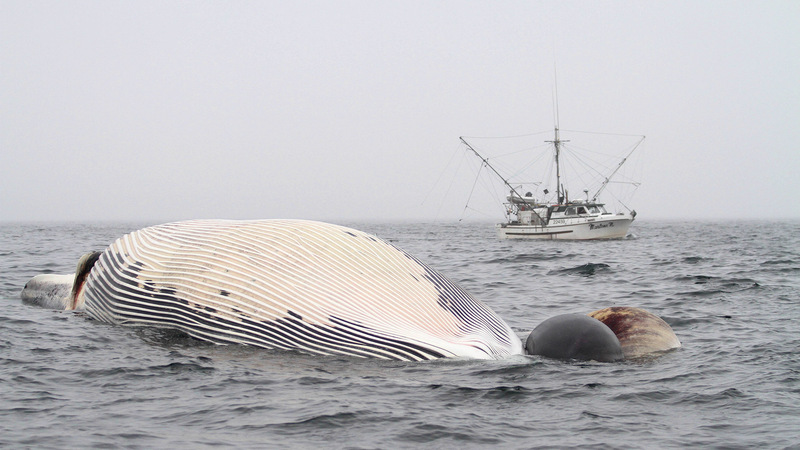 The fin whale is the second largest after the blue whale, and is resident to our north pacific waters. Relatively little is known about this species. 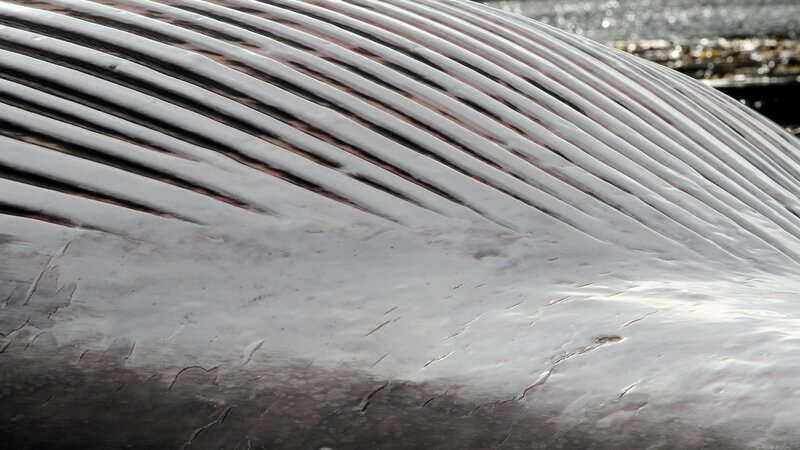 For example, we do not know where fin whales go in the winter, how long they live (though likely they have a relatively long lifespan), or how many are out there. 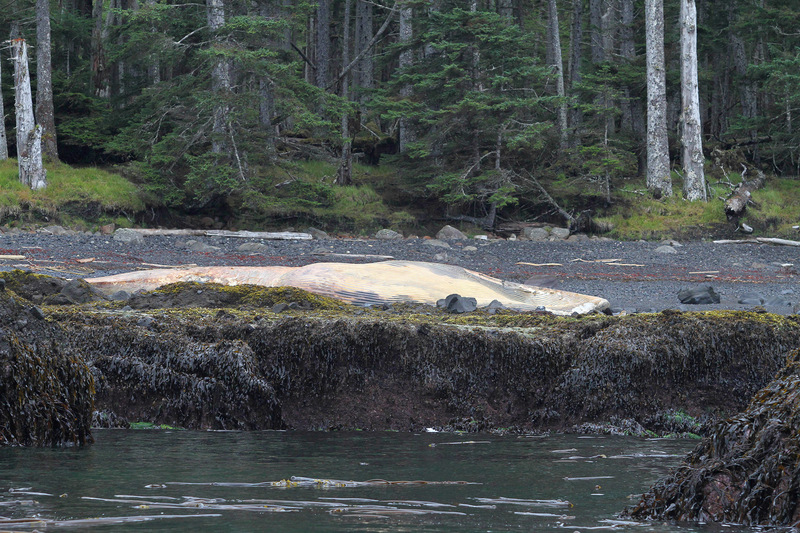 DFO Scientists are leading the charge here in B.C. 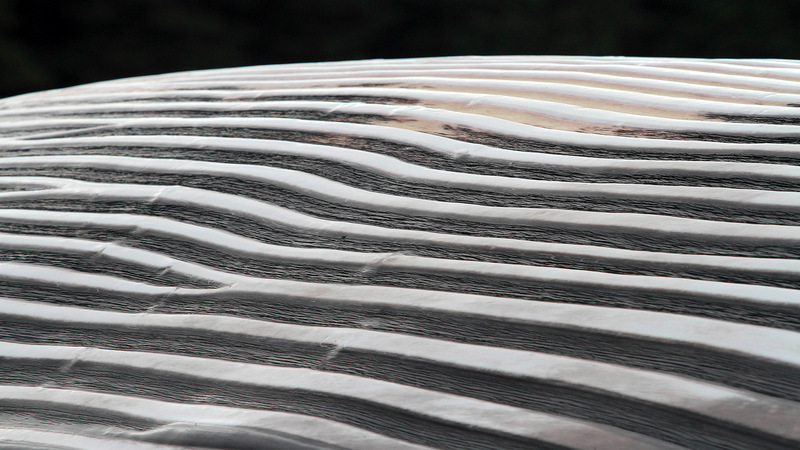 to learn more about these animals, including a population census. 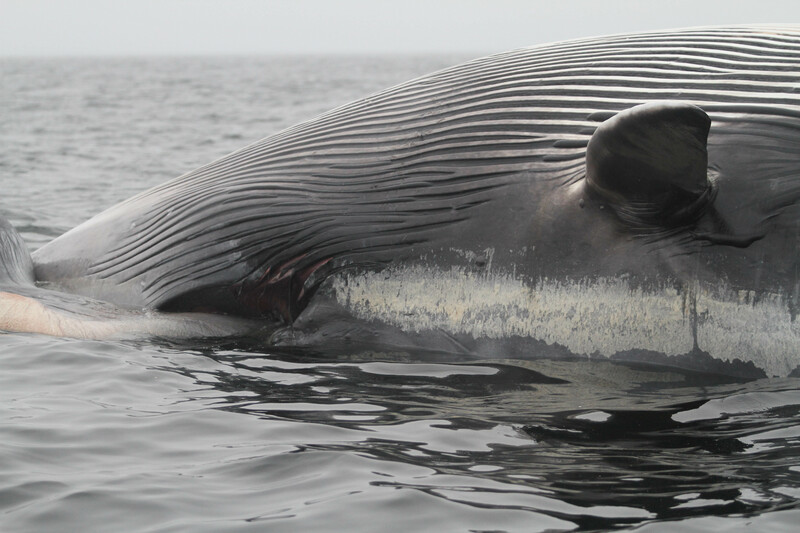 Fin whales are making a bit of a comeback on our coast after being heavily hit by whaling up until the end of the 1960s. 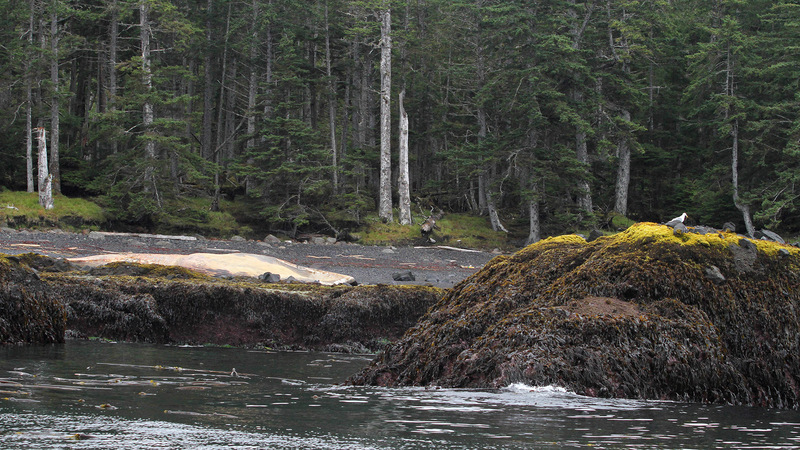 Queen Charlotte Lodge is built on the site of the Naden Harbour Whaling Station which operated here from 1911-1941. 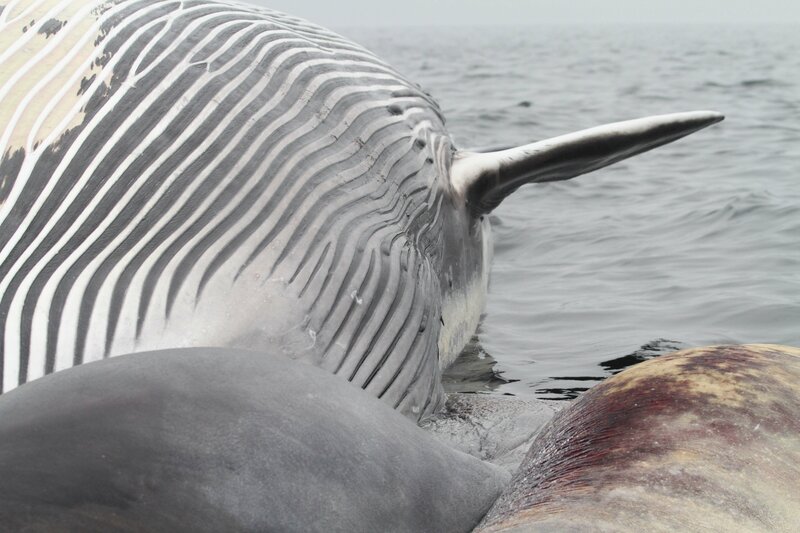 During that time more than 3000 whales were processed and approximately 1363 of these were fin whales. The valuable oil was used for lamps, candles, machine lubricant, cosmetics, explosives, glue, insulin, margarine and soap. 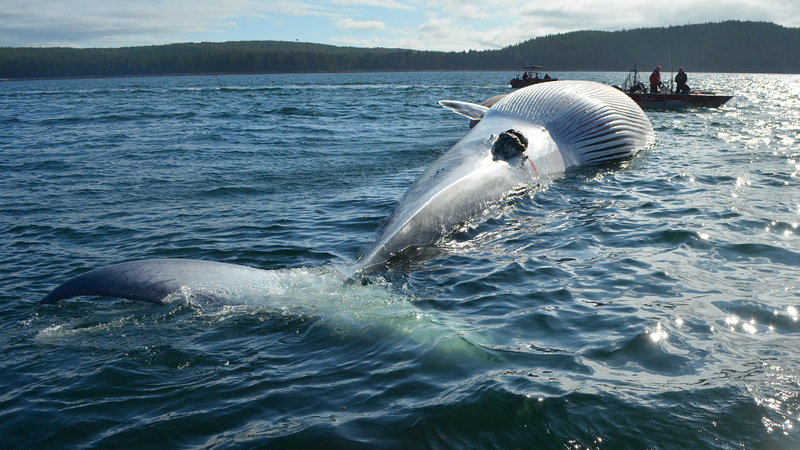 Fin whales prefer the deep water off the continental shelf of Haida Gwaii and we’ve never spotted one in the relatively shallow waters of Dixon Entrance where Humpback, Grey, Minke and Orca are much more common. 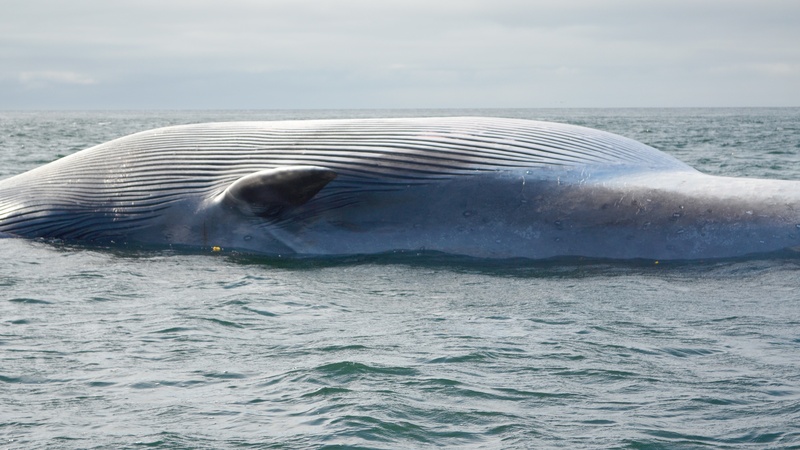 For more information there are some really interesting posts on wildwhales.org Click here for more info! 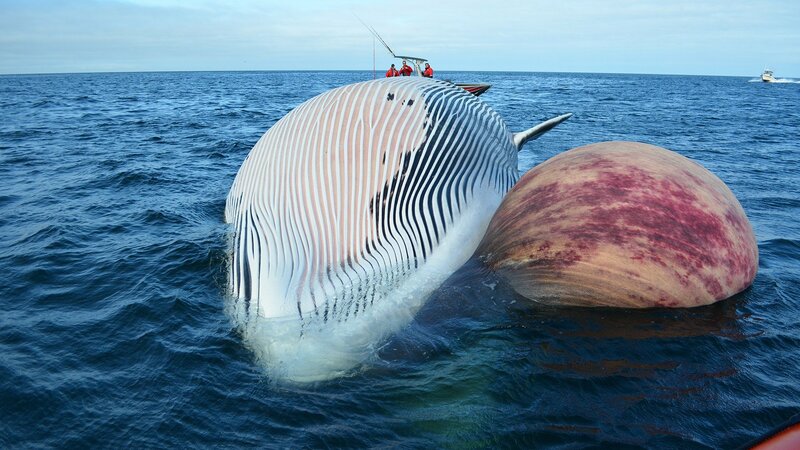 The whale drifted around quite a lot with the winds and tides over the next 2 weeks but eventually washed up on the beach where it will feed a host of animals and birds for months to come. 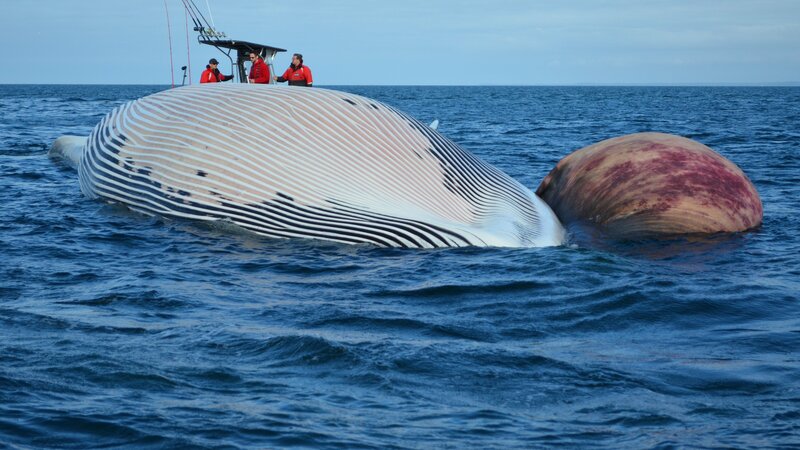 To see more photos of the fin whale check out the collection on QCL Shooter’s Gallery.